Sandy Springs Diner is pretty, in a 1930s way, compact, with perhaps 12-15 places to sit and a small bar that can seat six. 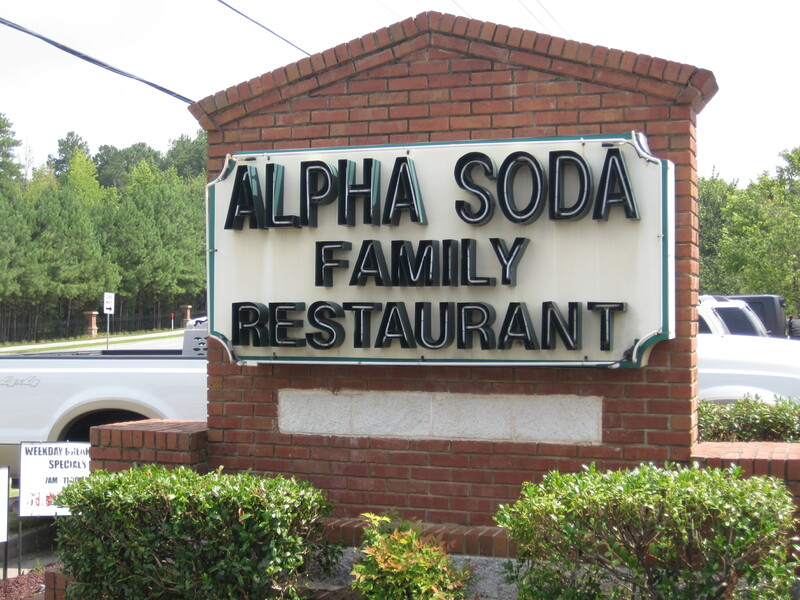 I suspect it’s old, but unlike the Alpha Soda Restaurant on Alpharetta, the history here seems to be entirely lost. I came here during an off hour, as 3pm is a time when most restaurants are closed. And despite that, I was served immediately and service overall was good. 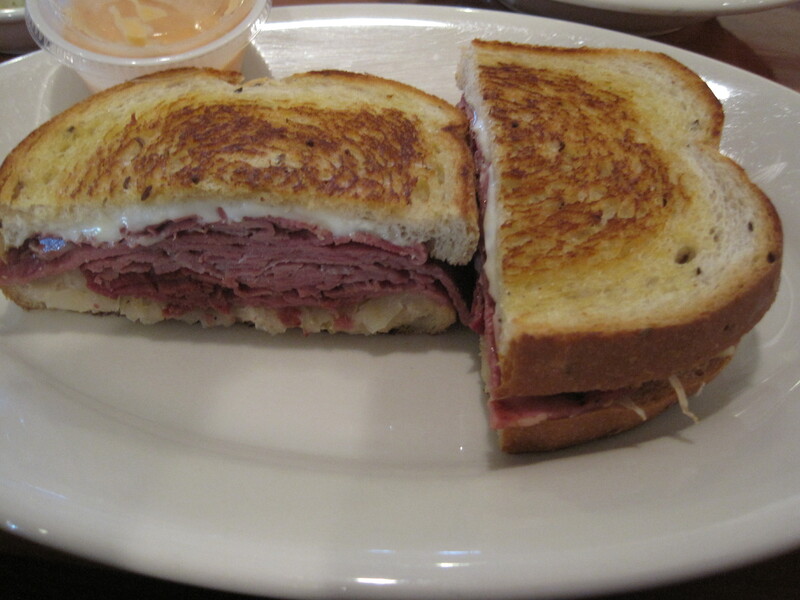 The corned beef for the reuben I had was thin sliced and pure corn beef. I was wondering why I hadn’t the flavor of my previous reuben and then realized the meats weren’t the same. Pastrami. Corned beef. duh. The sandwich is solid, with plenty of meat and a good helping of saurkraut. 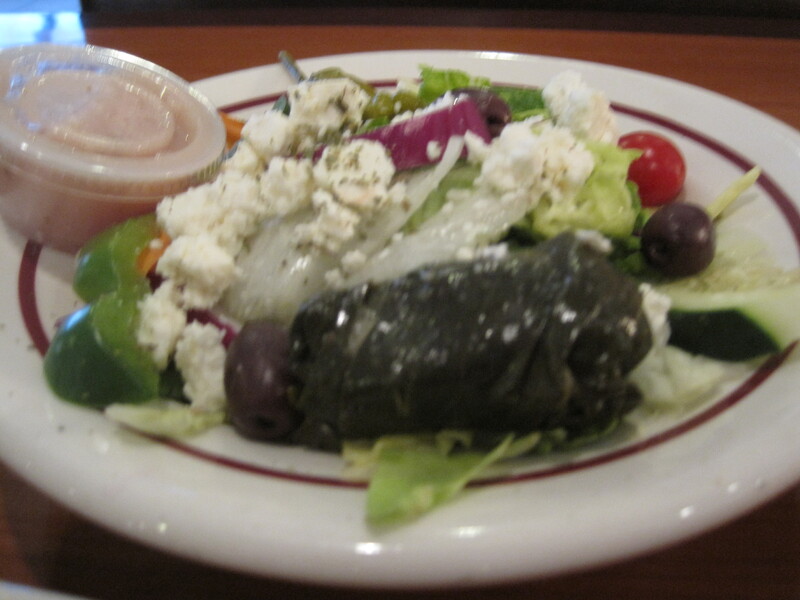 The Greek salad was worthwhile and filling, spot on in its flavors, with some really good black olives. The menu, to note, is not a carbon copy of others in the area, and has a heavier emphasis on seafood platters than most. I’d suggest trying sandwiches first before trusting any of these huge diner menus to their most sophisticated items. But in this case, thumbs up to the sandwich. 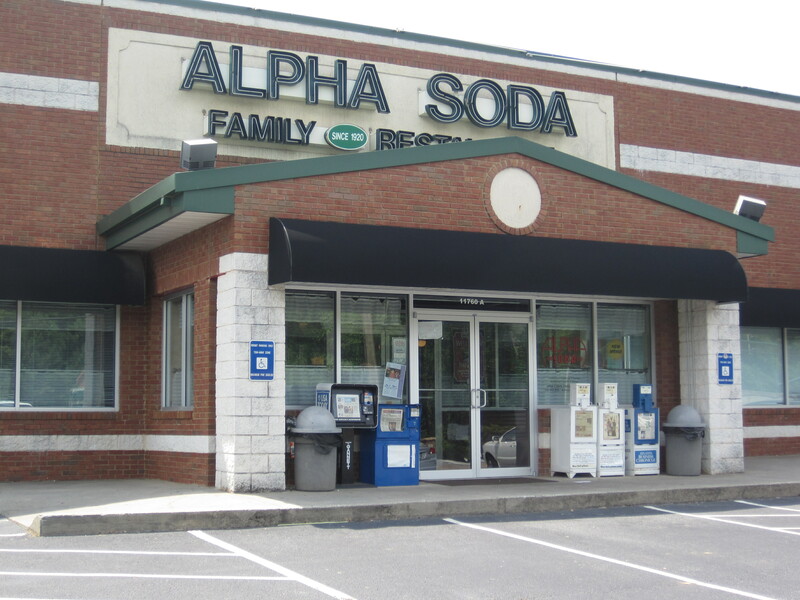 Alpha Soda is in the same mall area as Mambo’s Cafe, a little weatherworn and sitting in its own niche. There is a history associated with this 90 year old restaurant, one someone who publishes, fast, as I do, can’t really dig into. But the name is evocative enough: just what is an Alpha Soda? Did it exist? Was it served in a soda fountain only, or did they bottle it? Was it why the restaurant was invented, or was the soda just a side effort in a town awash with Coca Cola? Trying to figure out the history and heritage of the restaurant is deserving of an Atlanta magazine article or a long essay in the Sunday magazine of the AJC. Just, in the “get a bite and get an impression” world of amateur blogging, I’m not the one with the resources to do it. Inside, the heavy wood, the frosted glass, used to create this space evokes images of old East coast eateries, places like Bookbinders in Philadelphia. It reminds me in one sense of shopping for used furniture in the East, in the old shops where men with gnarled hands strip old hardwoods and make better-than-new heavy antiques for 20something home buyers. It reminds me of the desk on which I write these essays, so heavy two men are needed to lift it. Yes, the furniture and the glasswork evoke that kind of image. To return to the restaurant: It’s nice inside, the redwoods, heavy and comforting. I’ve been at lunch and also around dinnertime, when a few words on the Internet led me to the gaming group that hangs out here on Thursday nights. 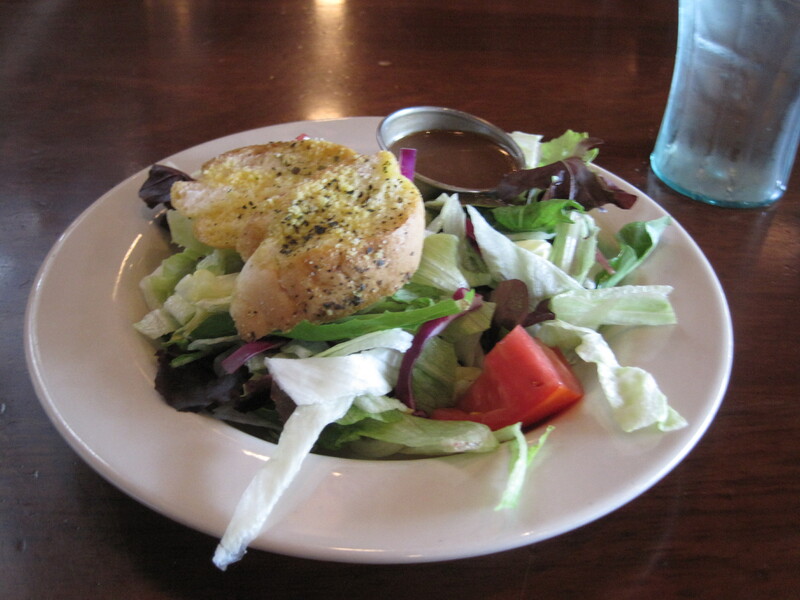 At lunch I had their salmon entrée, a good chunk of salmon with sides, and at night I was asking for a salad and their bunless burger. Service has been quick and efficient each time. The night time manager came by the gamers, made sure they were comfortable, was really nice. Clientèle appear to be people familiar with the place; being 90 years old has its perks. 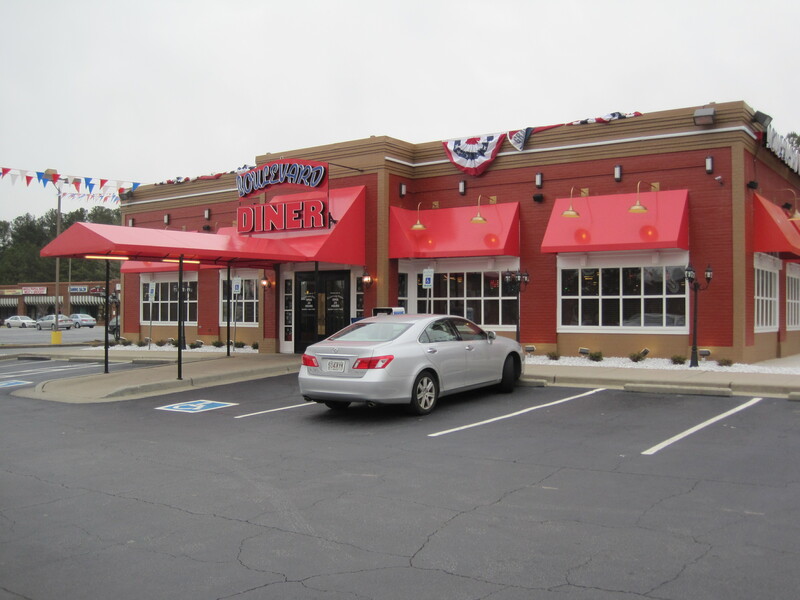 No, I don’t expect the “in crowd” from ITP to ever come running up highway 400 to this icon of an eatery in Alpharetta. It is, at this point, a better than average diner, with good entrées, a lot of room, nice interior, and a very rich history on the cusp of being lost forever, unless people take the time to preserve it. Given the AJC’s treatment of food journalism as a disposable, don’t expect it from our mainstream media. 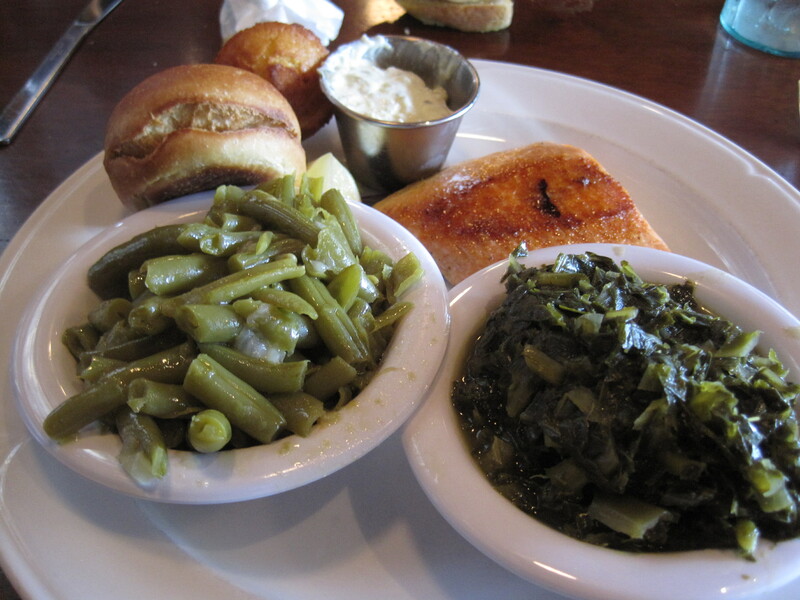 Verdict: A cut above the average Atlanta diner. Worth a peek for the history alone. Highly recommended. 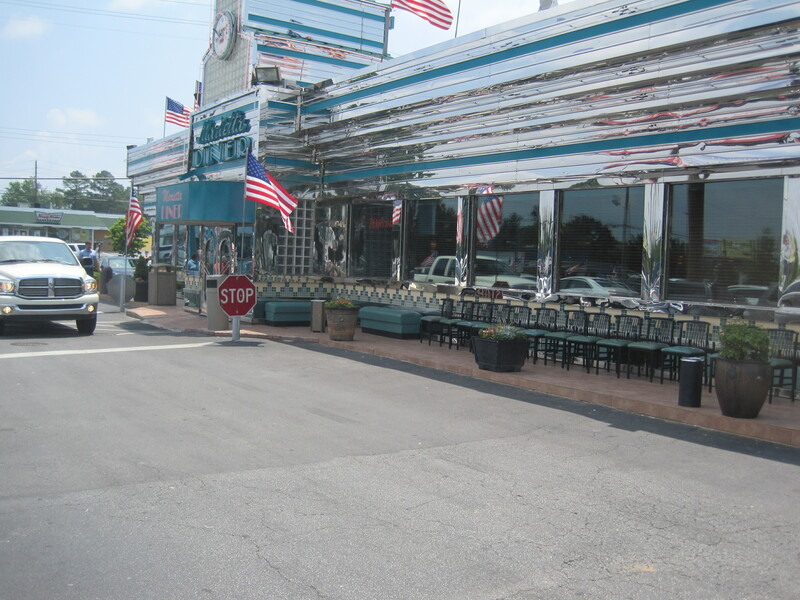 The Marietta Diner is an Atlanta icon, the model on which most diners in the city are based. It isn’t a product of random fame, but rather a function of it performing better than the competition. It starts with a good staff, dressed in white shirts and tie, staff that is courteous and cooperative. Having more than one staff member work with your table seems routine here. It continues with a deft handling of a large menu. Food isn’t all staples, nor is it boring. The diner has a good looking outside, though the combination of chrome, glass, and gray cinder block is an interesting one. 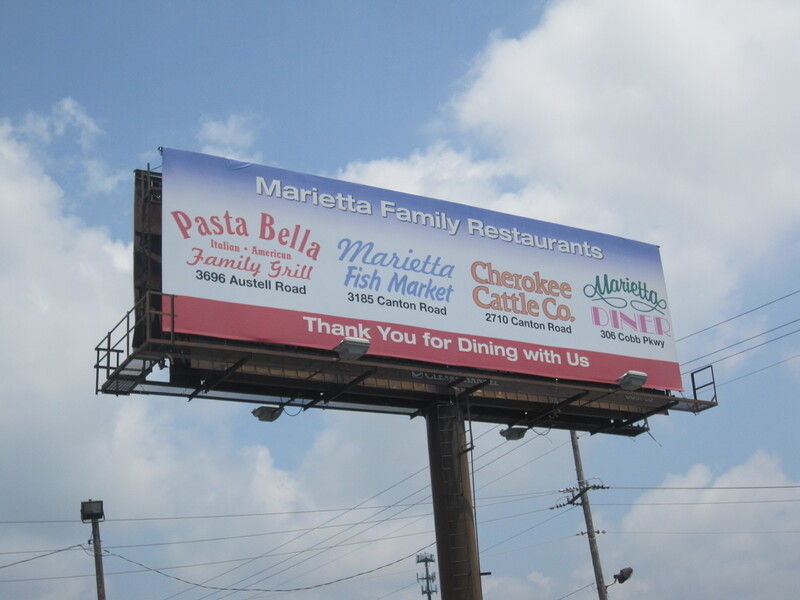 The Marietta Diner is part of a family of restaurants, the sign announcing the sister restaurants clearly visible from the diner parking lot. Inside, brown wood is supplemented with a color scheme dealing in burnt oranges and reds, resulting in a more subdued look than many neon and chrome diner interiors. On this day I had a series of dilemmas caused by the menu, which I mostly solved by making the most conservative choices I could. There was an Irish lamb stew in the specials, which looked really good. But did it have potatoes? If so, how many? 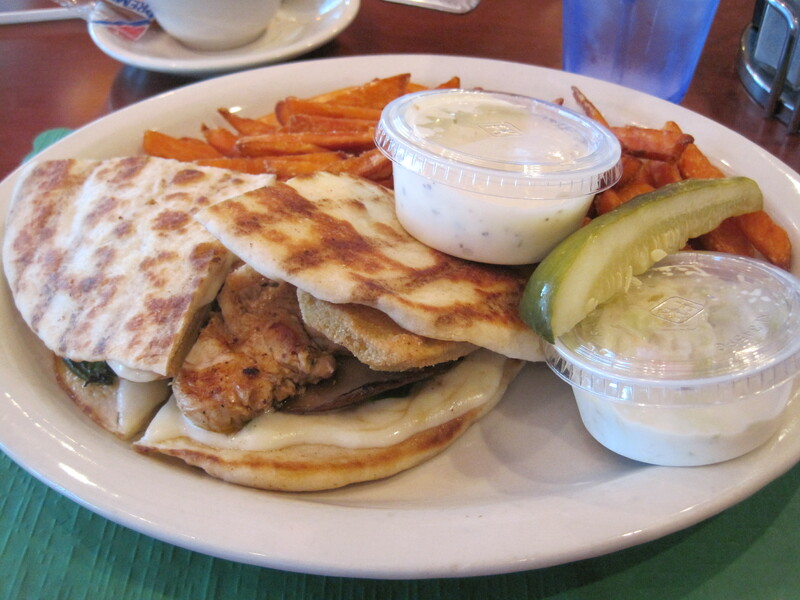 So, I chickened out and had the Mediterranean panini instead. Yes, it had sweet potato fries on the side, but I didn’t have to eat them. It came with a soup, so I chose cream of spinach, trying to avoid the pastas of, say, chicken noodle. The soup came out quickly. 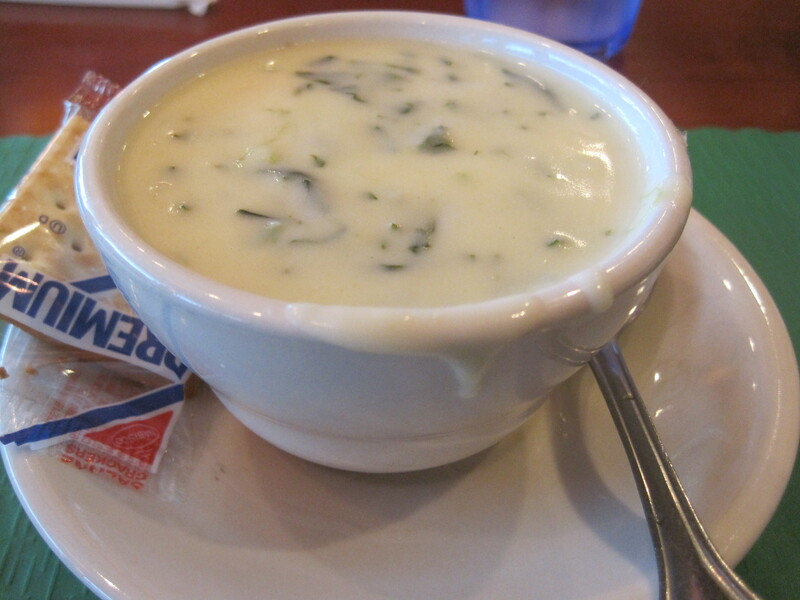 I tasted creamy, buttery, and cheesy flavors in the soup. 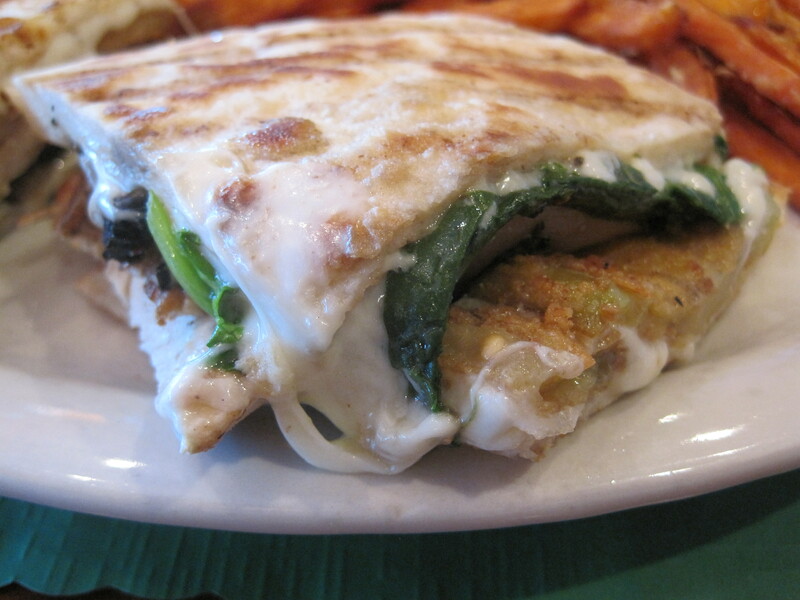 The flavors of spinach were more hinted at than dominant. This isn’t a food I’ve had much of, since my diet pretty strictly limits my fat consumptions, and the soup was quite rich. The panini was an interesting dish. There was far more cheese in it than chicken, and the vegetable slices were thick and delicious. The chicken that was there added a distinct grilled flavor to the sandwich and the gooey cheese acted as the glue that held it all together. The serving of fries was huge and enticing. I had one fry. I couldn’t resist. In general, dishes in this eatery were enormous. The wings plate and the chicken fried steak plates served next to me could easily feed two people. Take out bags looked like grocery shopping bags. Desserts, in glass and chrome display cases, were huge. This diner brings back memories, as the first place I stayed in Atlanta was a couple minutes away from this diner. Age seems to have enhanced the reputation of this eatery. Guy Fieri’s visit made it much easier to get my family here (no photos of that visit though). And the sheer efficiency of the place, the quality of service, the easily accessible menu keeps people coming back for more. Verdict: An iconic diner that easily holds up to its reputation. Highly recommended. Notes: Other blog reviews of this diner include one by John Bickford, another by Amy of Amy on Food, and also the blog Vainas Varias. The Boulevard Diner is in the same strip mall as Kan Pai Cafe, part of what looks like a renovation of this strip mall. The restaurant is bright, pretty, flamboyant and had been open for a whole five weeks when I visited recently. It’s a 24 hour affair, and inside has much the same shiny neon-steel-and glass look that people associate with modern diners in this town. Inside, there is plenty of staff and plenty of seating. The menu, though similar to others I’ve seen, is not the same as others I’ve seen. 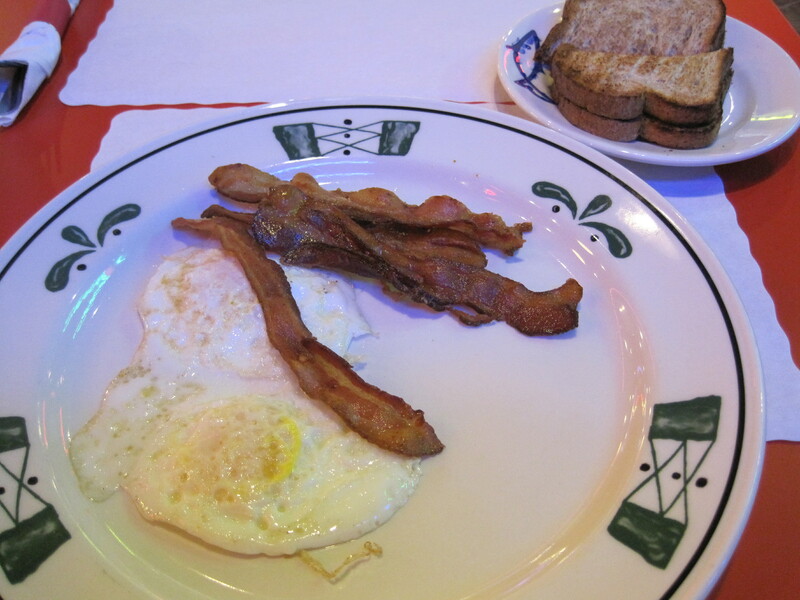 Since this was lunch and I was feeling cautious, I told the staff I was on “a strict diet” and ordered bacon and eggs. They came quickly. The eggs were good but hardly any test of the quality of the cooking. That’s going to have to wait for another time or another blogger. What I can say is that staff was well dressed, and seemed quite responsive to my requests. The manager dropped by and asked how I was doing. These are all signs of a place trying to do its best. As I left, I couldn’t help but note the pretty cakes and pies in glass display cases all around the cash registers here. Yes, a common motif but perhaps one that is reassuring. This style of diner is an enduring formula in Atlanta, and hopefully this will turn out to be another good example of the iconic eatery. Verdict: Only a first impression, but a decent first. Recommended for now. I spent the last week in the Bay Area, eating in spots from downtown San Francisco to San Jose’s Japantown (yes, San Jose has one too). I saw an incredible supermarket in Cupertino, an enormous flea market in San Jose, and I have pictures of much of this. So over this week (perhaps next) there will be a lot of articles about Bay Area eating and shopping. In the meantime. we arrived late enough to need a 24 hour eatery, and one of the best diners near Snellville is the Metro Cafe in Stone Mountain. We had two specials, a grilled lamb shank and grilled tilapia there, and we also had hot wings. 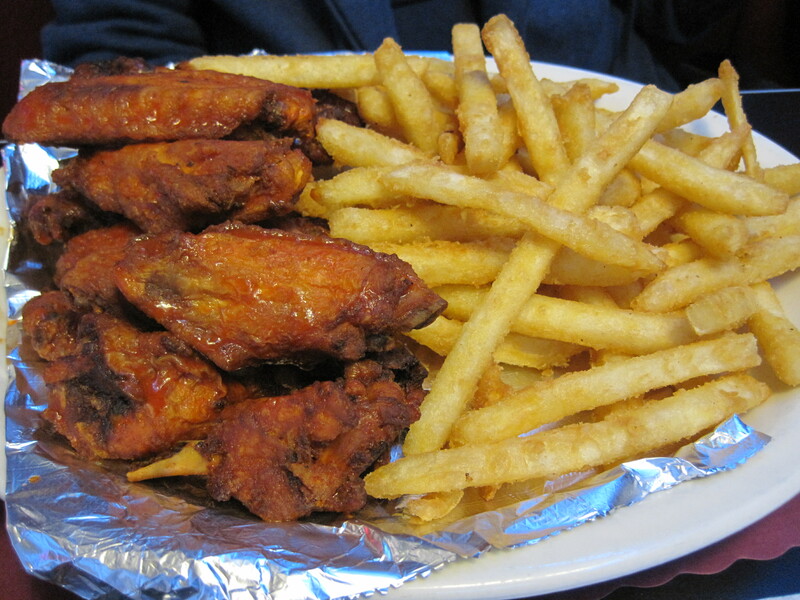 The hot wings fared best in our hands, large, dry and spicy. 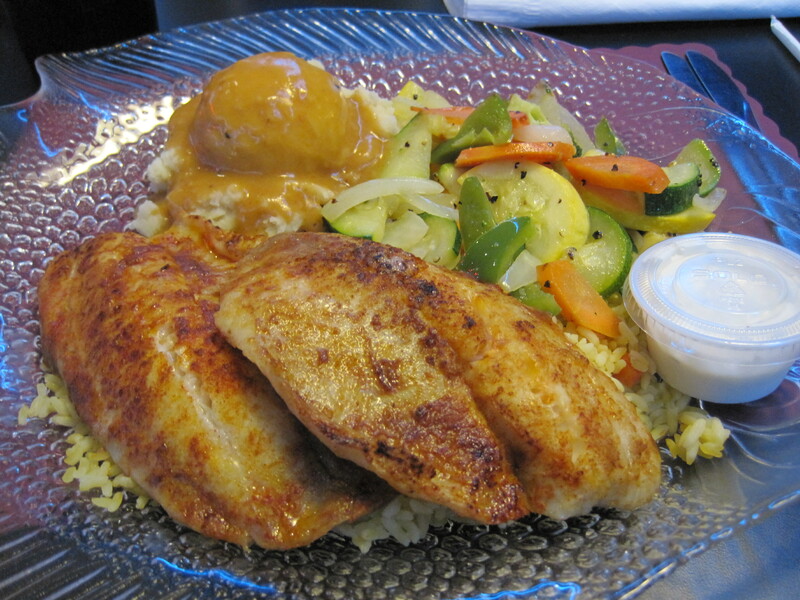 The tilapia serving was enormous, and accompanied by a decent set of steamed vegetables, mashed potatoes, and a ton of rice. The tilapia was good, but lacking in spices. Tossing some black pepper on the tilapia cured a lot of the lack of taste. 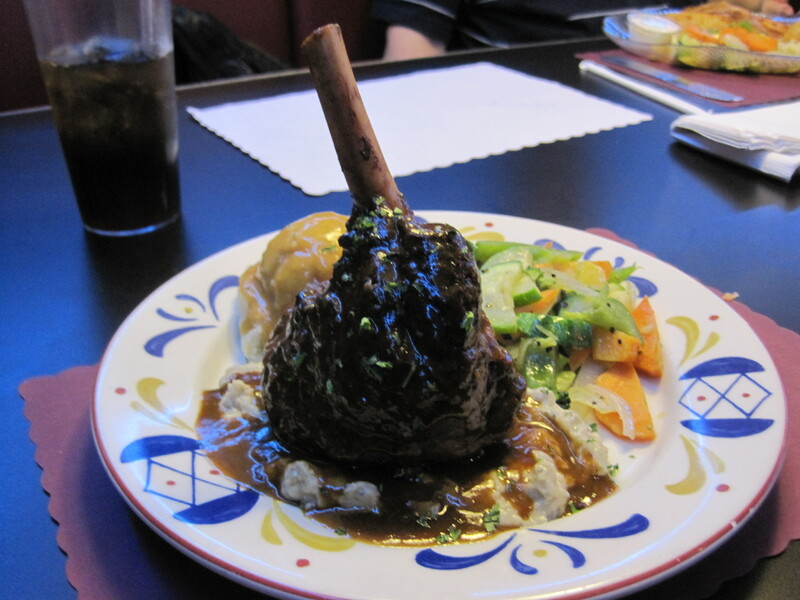 My daughter ordered the lamb shank, which she originally thought was good and then later decided was just ordinary. I had a taste. Yes, not much flavor from a chunk of meat that should have been flavorful almost by default. It was very tender though. It’s a pretty restaurant, with great hours and an almost perfect location. But it has a history of erratic health inspections, and in my hands it has a history of being good to very good one day and ordinary yet another day. I’ve eaten there at least six times. Four times were good to excellent, the other two not so good. 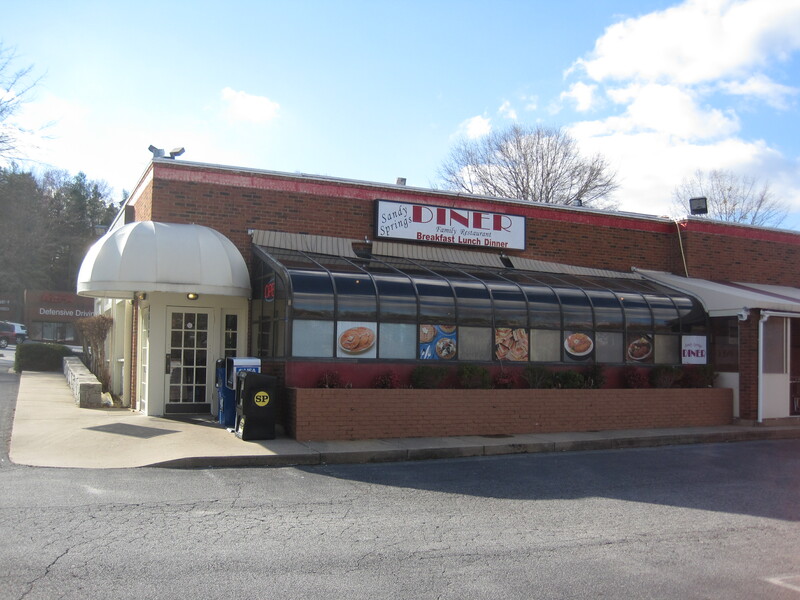 Like most diners in the Atlanta area, it’s almost a Greek deli in disguise. Gyros, souvlaki, baklava are all part and parcel of what they serve. The menu is enormous, with hundreds of choices, and that begs the question of how expert a chef can be when they have 200 or so different items to cook. 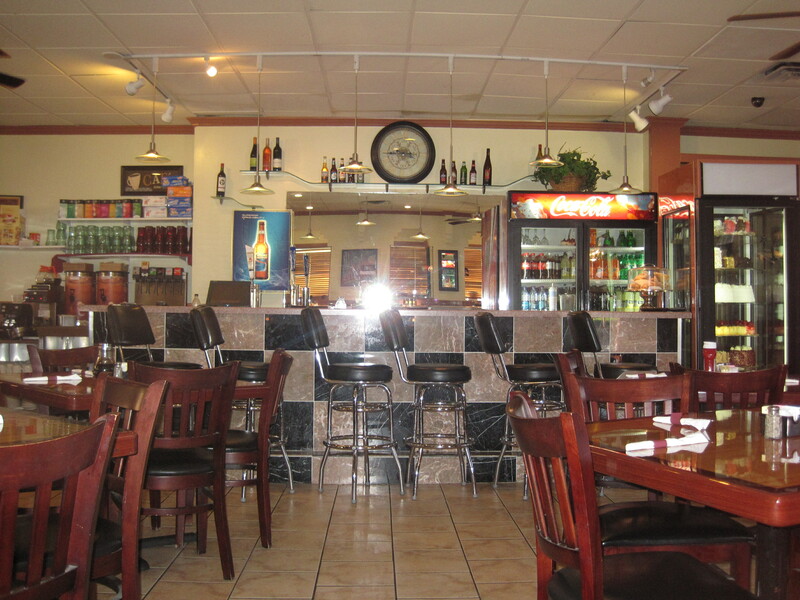 It’s located at the corner of highway 78 and 124, in the same mall as Sri Thai and Provino’s Italian Restaurant. Like all diners it’s heavy on the neon and like many diners, it’s open late, usually until 11pm. The last time I ate there it was after 10pm and I wanted something, anything to eat before I went to bed. I asked for a cheeseburger, medium, with Texas fries. There were three other groups of people in the restaurant around me, a pair of young women just in back of me, a quartet of older ladies and gentlemen in front. Across the restaurant and sitting on a stool were a couple of older men. Service was good this night, and the burger came back quickly. It was a half pound burger, the meat wide and thin, and pink in the middle. The burger was served with lettuce, tomato, mayonnaise, and mustard on the side. The Texas fries, a huge portion, were unusual. Instead of being a quarter inch thick and maybe an inch wide, these fries were made by cutting potatoes into inch wide slices and then quartering the slices. Nonetheless, both the burger and the fries were quite good. I’ve had generally good luck at the Snellville diner with burgers and sandwiches. Verdict: With some careful menu choices, you’re likely to get good food. But I can’t guarantee it.